We all have heard the term ” it happened in a New York Minute,” right? Well I learned the true meaning of the phrase just a few weeks after moving to the city. Things here happen fast, and you’ve got to be preapred for whatever comes you way, before it comes your way. Foundation: Bare Minerals Original Foundation with SPF 15 is the perfect foundation for a fast face fix! This foundation has become a cult-favorite over the years and as soon as you try it, you’ll know exactly why. I just place a dab into the lid of the container and “swirl, tap and buff” my way to five minute perfection. The mineralized powder spreads so evenly and light, and leaves little room for error like with a liquid foundation. I use “Medium Tan” but a quick stop at the makeup counter will help you find the perfect shade match. Bronzer: Too Faced Sun Bunny Natural Bronzer . From my fair-skinned friends, to my deep-brown beauties, this bronzer is perfect for so many shades and it adds the perfect sun kissed glow in a flash. The pink undertones mimic how your skin naturally reacts to the sun, so it looks just like you’ve left the poolside! I just use my EcoTools powder brush to apply on the places where the sun would naturally touch my face, like my cheeks, forehead, and brim of my nose. Mascara: I used to shell out $30 on Diorshow mascara, but then I learned the (top secret trick) from one of my good friends (and Sephora makeup artist) that a good drug-store mascara can do all of the same tricks, for a fraction of the price. I love to experiment with different mascara’s depending on my needs but for everyday, I’m loving Maybelline’s Rocket Express Mascara. Eyeliner: Maybelline’s Unstoppable Eyeliner is a make-up bag STAPLE! Goes on smooth, with no weird clumping or smearing. And, it’s under $10! This goes on in a flash without the fuss. Lipstick: To complete my five minute face, I put on a quick lippie to match the day’s mood and I’m ready to conquer the concrete jungle! Right now I have the Smashbox Be Legendary lipstick in Honey on rotation for everyday. Total time: 5:00 Feeling: Fierce! With the right tools, products, and a little practice, I promise you’ll master your five minute face in no time. What are your get-ready-quick tips that you love? I’d love to hear in the comments below! I wish I was that fast with a quick face but I think for me I would skipping a few or more items and going for an almost no makeup look. I adore that Dior Show too… but its so crazy expensive and cant afford that luxury! But… my secret is using L’Oreal Voluminous mascara. Its SO similar to Dior Show (in my opinion)… so try it next time! Love a good quick makeup routine! I love the rocket mascara — one of my favorite drug store ones! Wonderful quick tips! Can you believe I have yet to try Bare Minerals?!? I really need to get on the ball! UM. LIFECHANGING! You have to try it out! Great stuff, thanks for sharing! There are a few things I haven’t tried on your list—looks like I may need to head to Sephora soon. I love a quick makeup routine! As much as I love playing with makeup (or at least pretending to know what i’m doing) I like to keep it simple and to the basics! I use bare minerals too and love it! Oh yea, I am the queen of youtube makeup tutorials, when I want to go big and bold, I totally check out some eyeshadow tutorials and contouring tricks to add some pizazz to my daily look. Means alot coming from the make-up guru herself! Great tips! I have the bare minerals foundation, and I love it! I’ve been wearing bare minerals foundation (in medium tan) for 10 years! It’s my favorite too! I have to try out the Sun Bunny bronzer now that you recommended it! Isn’t it the best? It’s almost fool-proof and so easy to apply, the fact that it’s a mineralized powder (as opposed to a liquid foundation that needs to be applied very carefully) makes it so great for on-the-go! Ooh. Definitely would like to try that bronzer. I love having that golden glow. It’s so perfect! Too Faced has the best bronzers out there for all shades! Love this! 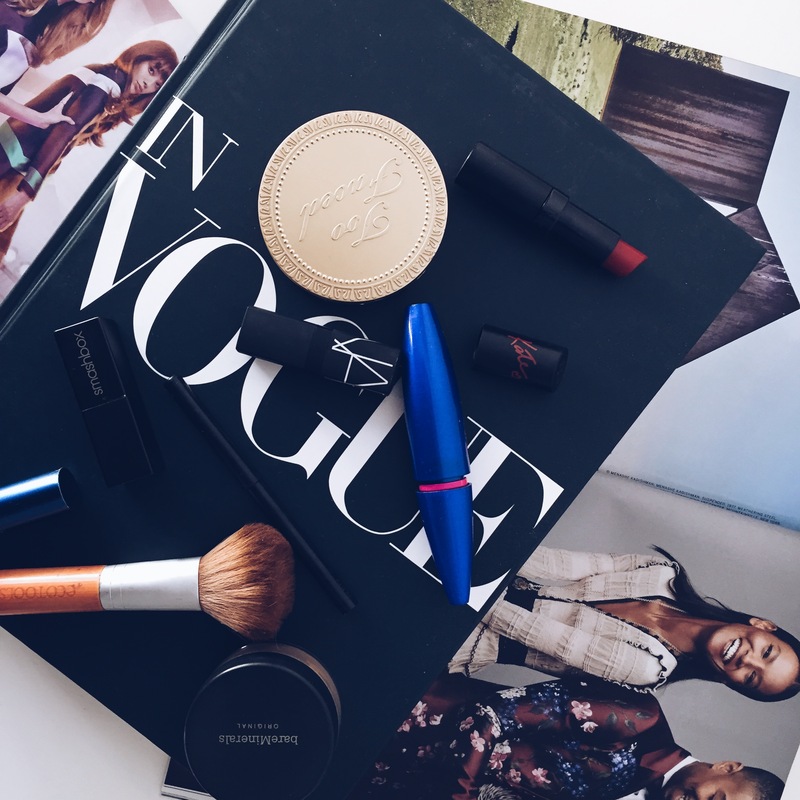 This is seriously my everyday make up routine if I am not going out or taking blog pics! Fast and easy! Great post!